Comrie and Carleton Place have been twinned since 1992. Conveniently located just outside the City of Ottawa, Canada Carleton Place is situated in the heart of beautiful Lanark County, on the banks of the scenic Mississippi River. 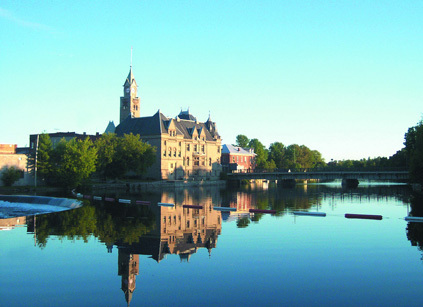 Carleton Place has a special quality: perfectly blending the old with the new. Follow the link for futher information on Carleton Place. Many visits have been made back and forth over the pond, the making of new friends and cultural exchanges. Over recent years there have been successful student exchanges between our communities where friendships have been cemented and indeed continue to this day. This year 2012 is the 20th Anniversary of our twinning relationship with Carleton Place. We are expecting a delegation including the Mayor of Carleton Place to visit early August so watch out for photo’s and information on a presentation celebrating the anniversary on the Ross Bridge. The European settlement of this overall area was the result of a plan of George III to avert the threat of an American invasion. At the height of the War of 1812, Lord Bathurst, Secretary for War, promoted the idea of diverting the tide of emigration from the United States, with whom the UK were at war, to Canada. This simple and appealing idea caught on and in the summer of 1815, ships set sail from Greenock on the River Clyde in Scotland. Military settlements were founded in nearby Perth and Richmond and from there, Beckwith Township, including present day Carleton Place, were surveyed and settled. Prior to the Europeans arriving in the early 1800s, the area was inhabited by the nomadic Algonquin Indians of the Mississauga Nation, descendants of the Ojibway. There was, apparently, very little contact between the Indians and the settlers, and no accounts survive of any enmity between them. Compensation for the use of their land, however, was not obtained until a treaty was signed in Kingston in 1819, a few years after the area was surveyed and settlers had already begun to arrive. Settlement rights for the first permanent residents of what is now Carleton Place, were originally issued on 19 September 1819. The first to arrive were the Moore and Morphy families, and the settlement became known as Morphy’s Falls. Edmond Morphy realised the potential of the thirty foot drop in the Mississippi River (Indian for Great River) on a previous visit and exploited it by building a grist mill. The mill was quickly followed by William Moore’s blacksmith shop, Robert Barnett’s cooperage shop and other businesses required by a burgeoning community. Later, the name of the village was changed by an influential businessman to “Carlton Place”, named after a famous square in Glasgow, Scotland. When the government postal service was introduced, the “e” was soon placed to correct an administrative error. The Carleton Place Library Association and Mechanics Institute was started in 1846, proof positive of the town’s increasing sophistication. For many years it was housed in private residences, but eventually found its way to the new Town Hall in 1897. (It is now in its own modern building). Carleton Place sent a large military contingent to defend against the Fenian Raids in 1866 to help offset another threat of invasion from the south. The village grew rapidly and new businesses opened to meet the needs of the growing population. The Brockville & Ottawa railway (built to the Provincial Gauge of five feet, so as to prevent potential American invasion) reached Carleton Place in 1870. After both railways were bought out by the Canadian Pacific Railway Company, the locomotive repair shops continued to operate. 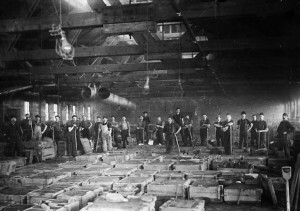 A number of very large lumber mills opened here and the competition was so severe that one dispute over river rights in 1884 ended up in the Supreme Court and the Privy Council in London, England. 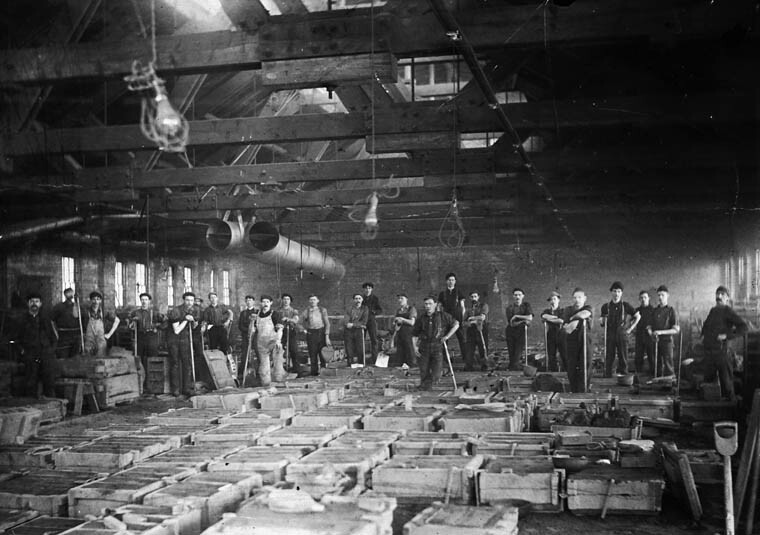 The Town was well equipped with several woollen mills and machinery works, which provided excellent domestic products. The Findlay Stove Company opened in the early 1860s and continued until 1974, manufacturing a wide range of heating devices that were shipped worldwide. I hope all is well with you and your family and a belated “Happy New Year” to all of you there! A busy start to the year for us here, hampered somewhat by the snowiest winter we have had in quite some time. We had nothing to speak of in the way of snow last year (not by our standards). In November it started snowing here and it hasn’t stopped. A mild spell last week melted vast quantities of it which is good. But 10-20 cm is forecast again this weekend. So, we are bracing ourselves! At least we have somewhere to put it now. If we hadn’t had the melt I’m not sure how we would have fared with 10-12 weeks of winter still remaining. I have heard from George Lees this week and he is very excited about the prospects for a Student Exchange involving our two communities this year. He tells me fundraising is underway, with a Robbie Burns Night a week from tomorrow. Excellent! We wish you well with that event and your future fundraisersOur committee meets Sunday and the exchange will be high on our list of topics. Everyone on our committee will be very excited about this latest news. If there is anything we can do to assist, in any way, please don’t hesitate to contact me and/or Mayor Wendy LeBlanc who, as you know, is also a member of the Carleton Place Sister City Committee. Lots of planning ahead, but that is what makes this sort of thing worthwhile and enjoyable in my experience. I very much look forward to working with all of you in Comrie on this important venture. 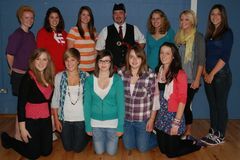 It appears our young people would probably come your way in late August and that your contingent would visit us in October, during the school break in Scotland. We will work out all of the details of course! Obviously we would be pleased to have you visit us Andrew, either during the exchange or at any other time of your choosing. We would like to pay you back for the wonderful hospitality we were shown during our stay in Comrie in August. We can’t thank you enough for all you did for us! I trust things are looking much better in the village now that the flood mitigation project is proceeding. Hopefully 2013 will be flood free!! Well, just finishing the work week here. I am about to pick up Kathleen at her work place and the Maguire’s are planning a quiet Friday evening at home. A bottle of wine is on the agenda I believe! Best wishes from all of us here and I look forward to corresponding with you throughout this year.